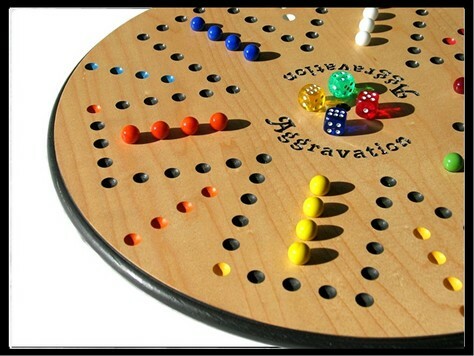 Aggravation is a classic marble board game that is designed for four or six players. A four-player Aggravation board uses either a square or circular cut board design. 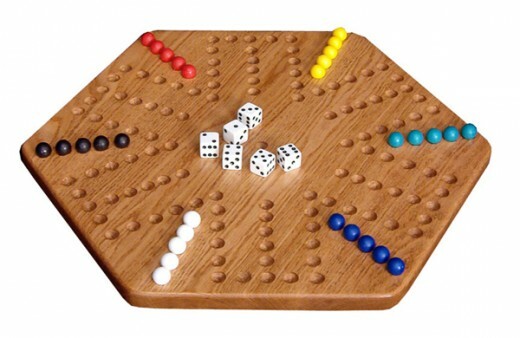 An eight-player Aggravation board will use either a round or octagon-cut board. Design and make a homemade Aggravation board using an 45 by 45 cm (18 by 18 inch) piece of veneered plywood. Make sure to drill the holes at a uniform depth to help with appearance and to ensure the marbles are solidly in each hole as the game is played. Draw a line from opposite corners on the 45 by 45 cm (18 by 18 inch) veneered plywood to divide the board into four equal parts. Place the board on a square table so one side is parallel with the edge of the table. Find the intersection of the two diagonal lines. This is the centre of the board. Place a mark on each diagonal line that is 5.6 cm (2 1/4 inches) from the centre of the board. Connect the four marks to make a square. Draw a straight line parallel to the edge of the board from the corner of each square. Draw each line 15.6 cm (6 1/4 inches). Connect the bottom points of each set of parallel lines to create a "U" shape. Repeat the process for a total of four sections. Measure and mark each 15.6 cm (6 1/4 inches) line every 3.1 cm (1 1/4 inches). The completed drawn shape will look like a plus sign. Measure and mark the diagonal lines 7.5 cm (3 inches) away from the centre mark. Continue making three more marks on each diagonal line that are 3.1 cm (1 1/4 inches) apart. This will make a grouping of four marks on each diagonal line. Create a well or depression on each mark with a plunge router. Plunge the holes so they are 1.8 cm (3/4 inch) wide by 9 mm (3/8 inch) deep. Holes to plunge include the centre hole, the plus sign shape and the sets of four on the diagonal lines. Sand the surface of the board and the well depressions. Remove all pencil marks with sandpaper. Wipe the surface with a soft cloth to remove any dust. Apply a coat of stain to the board. Let dry for one hour. 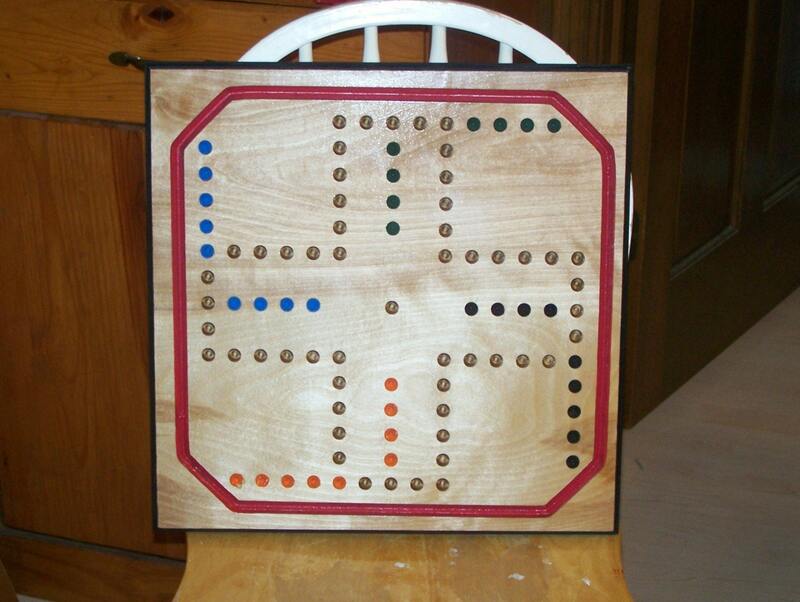 Apply four separate colours of acrylic paint to the board to indicate the players' marble area and starting positions. Place the board on a table with one edge parallel to the edge of the table. Paint the diagonal grouping of wells on the right -and side colour number one. Paint the bottom left-hand corner well the same colour. Turn the board with a 1/4 turn. Paint the diagonal grouping of wells on the right-hand side colour number two. Paint the bottom left-hand corner well the same colour. Repeat the process with the remaining two areas. Allow the paint to dry for one hour. Apply a coat of acrylic sealer to the surface of the board. Let the sealer dry for one hour. Lightly sand the surface. Wipe the surface off with a soft cloth. Apply a second coat of acrylic sealer. Let dry for one hour before use.